We live in a world where we come in contact with chemicals every day. We have plastic seats in our cars, plastic money, furniture covered with polyurethane, fumes from the paint on the walls and the plastic covering on TVs, DVD players and computers, clothing made from recycled plastic soft drink bottles and plastic wrap. Our pure, fresh, crystal clear drinking water contains chemicals used in the purification process. Even some of our processed food contains suspect chemicals. Many cleaners available at the supermarket contain a cocktail of synthetic chemicals that when used, leave residue on our skin, bench tops and cooking utensils. If you’re lucky you will get through life with only minor problems caused by this chemical invasion. I try to add as few synthetic chemicals to my life as I can. This, of course, means taking control of the chemical invasion and making many of the cleaning products I use in my home. I don’t mind doing this, it saves money as they are always much cheaper, and I know what is in the cleansers I’m using. I hope this will help you clean your clothes and your home using homemade cleaners. They are all easy to make, inexpensive and they are tried and true. Just a word of warning. We are all used to supermarket cleansers working first time, every time. They can do this because of the chemical power punch they deliver. You may have to tweak a homemade recipe to suit your individual needs, you may even look for different recipes. Whatever your initial experience, stick with it for a while because when you use the correct recipe for the job homemade cleaners work well. All my cleaning recipes work well here, however, hard and soft water, various greases, soil types and other factors play a big part in stain removal and keeping clothes clean. If these recipes don’t work first time, fiddle around with it until you get the right mix for you and your area. Everything is harmful if not used in the correct manner, even green chemicals. I’ve included a short explanation of the products we talk about. The ingredients are all freely available in any supermarket, but they still need to be treated with caution. If you buy these products, you’ll be able to use them for every cleaning job in your home. Each area does not need its own product. That is something made up by manufacturers and advertising agencies to help sell products. If you know why something works then you can use that knowledge to great effect when cleaning your home, and you’ll save a lot of money by doing it. Generally your cleansers will be used according to what material you’re cleaning. Wood needs polish to replace wood oils and to keep it from splitting, you’ll need a cleaner for plastic or Laminex surfaces, a scourer for porcelain and stainless steel sinks, a floor and wall cleaner, and laundry powder and stain remover for fabric. If you need an added antibacterial boost, just add a bit of tea tree oil to these basic cleansers. Get rid of the spray and wipe idea that you apply a specialist product to a problem area, wipe and it’s solved. Good cleaning in a simplified home takes a bit more time making the cleansers but though they are effective, they are less environmentally damaging and far less expensive. The answer to many cleaning problems is hot water and soap, sometimes you need to add something else, but often just plain old hot soapy water will work well. My basic cleaning routine in the kitchen is to wipe down the bench tops and stove with hot soapy water and a terry cloth. If there are spills on the enamel stove top, I pour a small amount of hot soapy water onto the spill about 10 minutes before I intend to wipe everything down. This loosens the food spill and it will generally be wiped away with the terry cloth. For stubborn spills or a greasy stove, use some bicarb. Shake a small amount onto the spill with some hot water and leave for 10 minutes. Then wipe it clean with wet terry cloth and dry it with a dry terry cloth. You don’t buy terry cloth wipes. Make them yourself by recycling your old towels. Terry cloth is full of woven cotton threads that create a rough texture on the cloth. It is this roughness that is useful in cleaning as it picks up dust, grease and dirt without scratching the surface. For stainless steel surfaces, stoves tops and ovens use two drops of eucalyptus oil in a litre of hot water. Mix well and use your terry cloth to wipe it over all the stainless steel surfaces. Wipe dry with a dry terry cloth. For stubborn food spills, use some of your homemade pure soap on the wet cloth and wipe the spill with that. Finish off with the eucalyptus oil and a dry cloth. The laundry is a convenient place to make up your cleansers and to store your big bottles of cleaning ingredients. Make up two small kits – one for the kitchen and one for the bathroom. Keep your cleaning equipment close to the area you will clean. For example, keep rubber gloves and a small bucket full of your homemade cleaners under the kitchen sink, keep another kit in your bathroom cupboard. Store these kits under the sinks in those rooms. Your home cleaning kit will include a small four litre bucket, rubber gloves and whichever of the homemade cleansers you choose for that area. All these products will cost you less about $30 to buy at the supermarket and you’ll have enough to make the recipes for various cleaning jobs for many weeks. WHAT’S IN THE CLEANING PRODUCTS YOU’RE ABOUT TO MAKE? This is sodium bicarbonate. It can neutralise acid, so it’s usually not used with vinegar or lemon juice. It can be used in several cleaning applications and it shines metal, porcelain, plastic and glass without scratching it. Mixed into a paste with a little tea tree oil and water, it makes an excellent bathroom cleaner. It absorbs odours so can be used in the fridge as a deodorizer and sprinkled on carpets to freshen them. It can be used as a deodoriser in the refrigerator, on smelly carpets, on upholstery and on vinyl. Bicarb soda, or baking soda - pH 8.1, is in the same family as washing soda. They are processed differently and washing soda, or sodium carbonate, is much more alkaline with a pH of around 11 Try to find a bulk source of bicarb. I buy a 5kg bag of it for $6 and that lasts me at least a year. Washing soda or sodium carbonate is a natural mineral. It can cut through grease and can be used on engines as well as to remove wax from floors and furniture. It softens hard water and is used in our laundry detergent recipe, along with borax and soap. Borax, or sodium borate, is a naturally occurring mineral. It is an ingredient in the washing liquid and powder we'll talk about tomorrow. It removes stains and boosts the cleaning power of soap or detergent. It is also a disinfectant and can kill ants and cockroaches. All soap is made from fats and lye – even the so called “natural” soaps. The fat used in soap can be either vegetable or animal. Vegetable oil could be olive oil, coconut oil, sunflower oil or any other vegetable oil. Animal fat is often called tallow and it is from beef, pigs or sheep. Lye is caustic soda but in the process of soap making the caustic soda is neutralised. Detergents are synthetic or man-made materials. Pure laundry soap – like Sunlight and its generic equivalents, or a pure soap you make yourself, are good for removing dirt and grease. I think the best soap for every purpose is homemade soap because you know exactly what is in it and you can make soap exactly for the purpose you need to use it for. Olive-oil based soap is gentlest on the skin. I've written a post on how to make an olive oil based soap. You can even make an inexpensive cleaning soap that uses cheaper oils than olive oil. You can also make soaps for a specific purpose – like dog soap, gardener’s soap, mechanic’s soap or very mild soap suitable for a baby. An all-purpose liquid soap for hand washing or washing dishes can be made by dissolving the old ends of bar soap, or grated pure soap, in warm water. Vinegar is an acidic solution made from fermented juice, grain, or wine. Vinegar can dissolve mineral deposits, grease, remove traces of soap and deodorize. It is a wonderful glass and mirror cleaner as if leaves no streaks. Vinegar is normally diluted in water, but it may be used straight. Buy cheap white vinegar for your cleaning needs. You can usually find this in a large two or five litre container. Tea tree essential oil is used as a natural mould and mildew remover. It may also be added to many other homemade preparations as a booster disinfectant or mould inhibitor. Tea tree oil is expensive but make sure you buy the pure oil, not the watered down oil. You’ll only use a few drops so the bottle will last a fair while. Make sure you buy Australian tea tree oil. Mixed with water this is excellent for cleaning stainless steel. It’s also the best thing to use to remove glue, stickers or labels. Make sure you buy Australian eucalyptus oil. Use the following two products with caution and never, never, never mix them together. I know this is not green but I use it for certain cleaning jobs like cleaning my mops and removing mould and mildew stains. I use a small amount of bleach when I do use it and I never allow it contact with my skin. If you decide to use bleach, be careful and follow the precautions on the bottle. Another non-green, but old fashioned, cleaning aid. You must be careful when using it and never smell the contents of an ammonia bottle; it will lift your head off. When using ammonia, always work in a well ventilated room. NEVER mix ammonia with bleach. These are necessary to avoid contact with any harmful solutions and bacteria. I use a nice half size bucket of about 4 litres. You can buy these at most supermarkets. You need a handle as you’ll be moving around and it’s easier to move four litres of hot water in a container with a handle. A small enamel or galvanised bucket would also be ideal. I use old towels that I cut up into 12 inch squares. Old flannel would also be fine. You need a natural cotton or linen cloth that can be rinsed out between wipes and then washed and dried between uses. Terry towelling works well as it has a soft roughness and lots of looped pile that assist in cleaning. Some people like the microfibre cloths. They do work well but I don’t see the point of buying an expensive cloth that is made of polyester or nylon when a recycled pure cotton cloth will work just as well. We have to get out of the mindset that there is a specialist product for everything. Try to recycle old towels, bath mats, shirts, and sheets. If it’s pure cotton or linen, then it will make a fine cleaning cloth. You can hem the edges if the frayed edges annoy you, but it isn’t necessary. PLASTIC SHAKER – similar to those used as a salt shaker in fish and chip shops. Put some of your bicarb soda in it. You can shake the powder straight onto the surface and you won’t spoil your bicarb by dabbing your moist cloth into it. This post is longer than I thought it would be, so tomorrow I'll give you recipes for all sorts of green cleaners, including homemade laundry powder and liquid. Short on words today, but these ingredients get me far -- and could take me further with a little more input of thought and elbow grease! But soap and water are what I use most. P.S. Visited the library and am now reading "Home Comforts" as you suggested. Thanks for the tip! 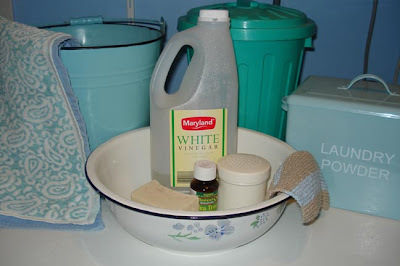 Good Post I use a natural project called Mrs. Meyers to clean my home. I also use baking soda. I have allergies so I am not into chemicals. what do you use to wash kitchen dishes? Other than the bleach and the ammonia these are my cleaning products too. It's lovely not to have to inhale all those terrible vapours from commercial products and I much prefer a terry or hand knitted cloth to any microfibre or sponge cloth from the supermarket. Hot water and soap will do the trick most of the time. Hope you're feeling better Rhonda. I look forward to seeing what recipes you have Rhonda. I make all my own cleansers now apart from dishwashing liquid and washing powder, I have never had success with the washing mixes I've made in regards to cleaning efficacy. you know i love this post! did you mention how much fun these items make cleaning?! I tend to use a bit of vinegar and regular dish washing detergent from time to time to mop my floors. I sometimes add a little bit of essential oil to the mop water..to make everything smell nice and pretty. For the bathtubs..baking soda does the trick on soap scum. I've always used bicarb as a "scrubbing" agent both int he bathroom or in the kitchen for removing burnt on foods and stains in coffee cups. Vinegar is the only fabric softner I use (when washing towels). Looking forward to seeing your recipes for other natural cleaners that I can make. wildside, what are you using the table salt on? Good to see you've got Home Comforts. Elizabeth, I've heard of so many people with these allergies. I wonder if they're becoming more frequent. Good to hear you're using the good stuff. phoeberae, I use soap to wash dishes in the sink. I hand wash most of the time now. If I have a lot of soap scraps, I melt them down with some added water and make a soapy gel that I store in a pump action dispenser. If I have no scrap soap, I just rub the bar of soap - either laundry soap or homemade soap - on my cloth and wash that way. I do have a dishwasher that I use when we have visitors, then I use either washing soda with a vinegar rinse or ordinary dishwasher detergent at ¼ the recommended rate. Polly, I love my terry cloths, they make all the difference to my cleaning. I'm feeling much better and back at work today. We're having a very quiet day here. Shell, I hope you find some of my recipes will help you with your cleaning. I experiment all the time with various things, so I do change what I do from time to time. Simply authentic, it is fun cleaning this way, and it makes me feel good about not damaging the streams with more junk. Hello Tina, I'm using fragrant oils with some of my cleansers now as I'm using old stock from a shop we used to own. When that goes I won't be buying more essential oils, except for tea treee oil which I don't like the smell of but use as an antifungal and antibacterial. Oh, I'm going to enjoy all of this. Except for ti tree. For some reason it makes me gag. Thanks RJ for passing on your wisdom and experience of home made cleaning products. I already have many and use bicarb soda a lot. Guess my cleaning will be easier too if I keep on top of it all and clean when I see the need in front of me. Glad to hear you are feeling much better too. I'm looking forward to the next post on this topic. I partially use these cleaners already but still resort to proprietary ones for toilet bowls and showers. It's nice to just read a post where someone else has laid it all for you instead of having to figure it out yourself! Although salt is good for many uses, I primarily use it in salt water soaks of cloth sanitary napkins before washing -- it is very good for taking out blood stains I dump the bucket down the drain or toilet flush as it isn't good to use for greywater since salinity kills plants. I use the same ingred. as you as well Rhonda Jean, just minus the bleach and ammonia. It is amazing how fresh your home feels when you use little chemicals. I love cleaning with essential oils...everything smells so good! Thanks again for taking so much of your time to write such an informative post! Wow! I use alot of these items and techniques, but you have given me some new ideas to try out. Well, gotta go buy some "cleaning salt!" I can't wait to see your recipes. I have most of the ingredients lined up on hand. Green bleach - Learnt this in my Scots-Gaelic language class. The women used to bleach their linens in the olden days laid out in urine-filled trays in the sunlight. The sunlight & it's heat turn the urine into bleach! When coming to a service level SKT cleaning services are been reputed in the market who is completely client oriented as they makes sure that the work which is been assigned have to be completed on time and with the same efficiency. Hence all the feedback provided by the clients are always been kept in priority and the company make sure that each and every word of the client is been taken care and the required changes for the best performance. Housekeeping Services | Home Cleaning Services | Cleaning Services In Dubai | Move In & Move Out Cleaning Services | Carpet Cleaning Services | Curtain Cleaning Services | Maids Services In Dubai | Office Cleaning Services | Cleaning Companies In Dubai | Housekeeping Services Dubai | Cleaning Services | Cleaning Companies | Ironing & Laundry Services Dubai | Deep Cleaning Services"